Orange Clove: delightful orange and clove. Our most popular year-round fragrance! Our simmering tarts are made from beeswax and scented with fragrant aromatic blends. Place the scented tart in an appropriate warming container and enjoy the aroma as it fills your room. In addition, these tarts can be used as sachets. An aromatic way to freshen up garments in dresser drawers or to hang in closets! 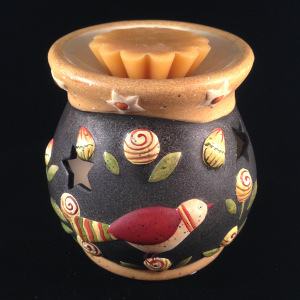 When using as a simmering tart, the beeswax can be melted using a traditional ceramic tart warmer heated with a tealight or an electric wax warmer. Beeswax tarts hold the fragrance longer than most simmering tarts, which will give you repeated hours of enjoyment. Tarts may be broken in half to last twice as long! Two beeswax simmering tarts come wrapped in a shear organza bag.